... "I feel a certain urgency, I really want to get that record made while I'm still able to," he says. "It was hard for me to set the album aside to tour, this really means a lot to me, I intend it to be my highest achievement lyrically and drumming wise, so I really want to get it done while we still can." ... "We have about six songs finished and waiting to go into preproduction and then be recorded. We've been kind of afraid to go back to them, because we don't want to start f**king around with them, we liked them at the time. We're very obsessive about fiddling with our own music, so we just said Okay, let's leave them in that state until we're ready to get more serious. 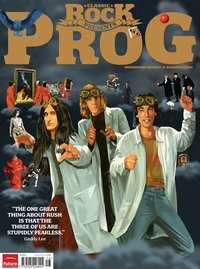 For anyone who would like to get a subscription to Prog or purchase the issue, you can do so via this website.